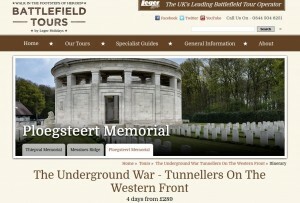 The La Boisselle Study Group is offering one ticket on Leger Holiday’s WW1 Battlefield Tour: The Underground War – Tunnellers On The Western Front. This four day tour departs from the UK on 31 October 2013 and is offered with single supplement already paid. Entrance fees to museums are also included. Full details can found via Leger’s website as shown above. The tour is being offered via Ebay. Please follow this link: EBAY or click the banner below. Your guide for this trip will be Leger Battlefields guide Iain McHenry who is also a founding member of the La Boisselle Study Group. As well as his work at La Boisselle Iain has been involved in archaeological projects at Vampire Farm, Zonnebeke and the search for the Livens Large Gallery Flame Projector at Mametz, both of which were shown at Channel 4 Time Team Specials. He has a specialist knowledge of tunnellers and has recently completed a book on 177 Tunnelling Company, RE. 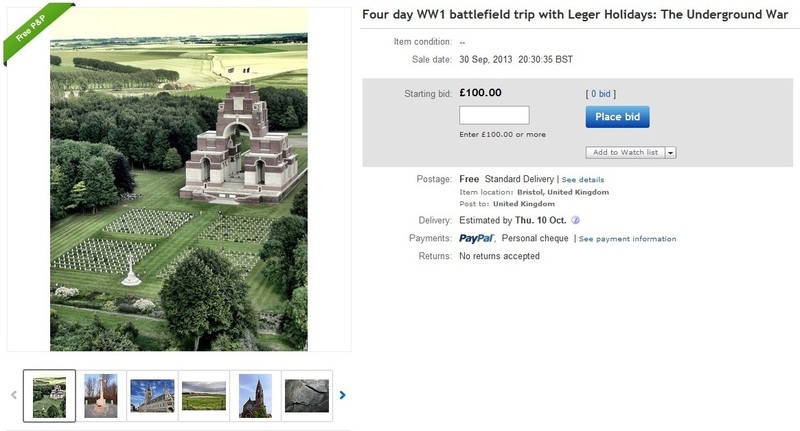 Our thanks to Alan Dawson at http://ww1-2tours.co.uk/ who very generously donated this prize.